President Obama has unveiled a national strategy to increase the population of the Monarch butterfly and the honey bee by creating the so-called “butterfly corridor” between Mexico and Minnesota along Interstate highway 35. 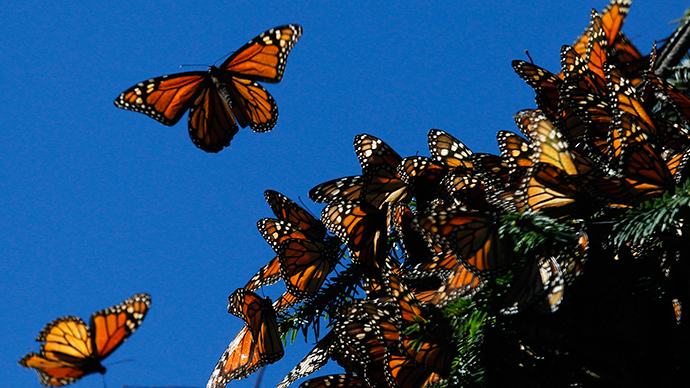 Monarch butterflies spend the winter in Mexico, and then begin what is known as a multi-generational migration. They lay their eggs in the southern US where they die and then the young butterflies continue their journey north to the northern US and Canada. Butterflies and bees do not recognize borders and countries so US agencies are working with Mexican and Canadian colleagues in ensure the project is successful. The number of Monarchs has been falling, partly because of the loss of flowers and milkweed, which produce the nectar crucial for the butterflies, and being killed off by intensive agriculture in the Midwest and particularly the herbicide Roundup. The plan is for the US Department of Transportation and the US Fish and Wildlife Service to help rehabilitate butterfly habitats along Interstate 35, one of the main arterial roads of the US which extends from the Mexican border to Duluth, Minnesota. Unlikely as it may seem, the conditions for both insects along the I-35 are ideal. “They constitute large land acreage on a cumulative basis, are generally maintained in sunny areas with low vegetation height (ideal pollinator habitat), and often extend for considerable distances, thereby potentially acting as corridors for species movement and adaptation to climate change,” the report released on Tuesday states. The federal interstate agencies will be able to coordinate efforts to rehabilitate and replant the prairie vegetation that the Monarchs need and create spring and summer breeding habitats along the route. The Fish and Wildlife Service has already set aside $3.2 million just for the Monarch project. The Pollinator Health Task Force, which is managing the project, hopes that if the Monarchs road trips are successful, their population will increase from 56.5 million today, to 225 million by 2020. The Task Force was set up by President Obama in June 2014 in order to address the issue of a decrease in pollinators across the US. The report makes clear that the project is not born out of good will and charity. Pollinators play a crucial role in maintaining ecosystems and in turn supporting agricultural production. It is estimated that pollinators and in particular honey bees increase the value of US crop yields by more than $15 billion a year.